Respondents’ level of agreement is captured using a 5-point Likert scale with 5 indicating strong agreement and 1 indicating strong disagreement. All scales reported in the charts below correspond to this 5-point agreement scale, unless otherwise indicated. Compared to 2012, there was a slight but significant increase in overall work stress levels across all employment sectors in 2013. Nevertheless, work stress levels as a whole have been below the scale mid-point of 3.0 since 2012. Generally, therefore, work stress levels have not been high for organizations in Macao, despite a robust growth in economic activity. Sectors with the highest work stress levels include the gaming, casino, finance and leisure, entertainment and cultural sectors. 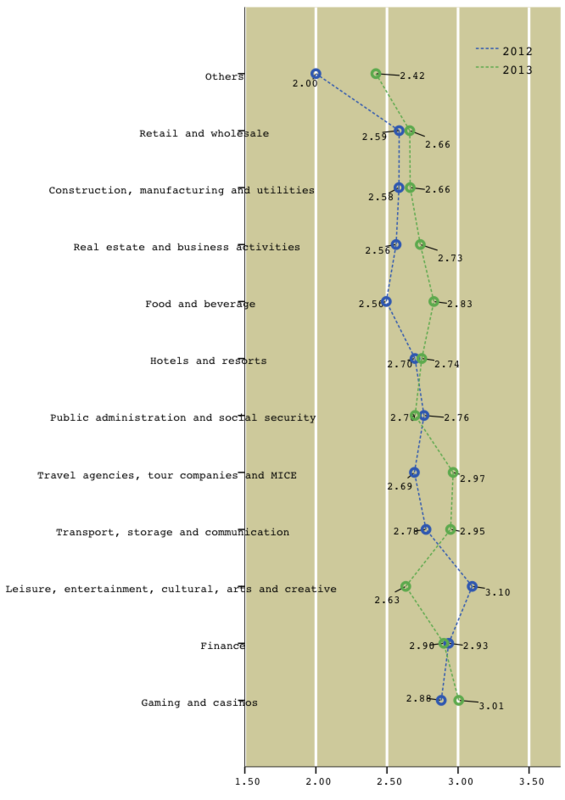 Workers in transport, storage and communication as well as travel or tour related companies and those in the MICE sector also report comparatively higher work stress than other industries. Nevertheless, the sector with the highest work stress levels in 2013, gaming and casinos (= 3.01), approaches only the middle of the 5-point scale, suggesting that workers in this sector find work to be neither too stressful nor too calming. There appears to be a significant relationship between the level of monthly income earned by workers and the degree of work stress experienced, with higher income coinciding with higher reporting of work stress levels. However, this relationship reverses sometimes, as has happened in the last two years of the MHRM survey. In 2013, workers with monthly income at MOP30,000 or more reported lower work stress levels than in 2012. The reverse was observed for workers earning less than MOP30,000 per month on average: Work stress level for these groups was significantly higher in 2013 than in 2012. Though there are slight differences in the level of work stress of workers having different types of educational attainment, these differences were not significantly different and attributable only to chance. Stress levels were higher in 2013 than in 2012 across the board for all workers, regardless of their residency status in Macao. Despite the significant increase (especially for permanent residents), overall stress levels for all groups are below the scale mid-point of 3.0. For married workers, work stress levels were more or less stable across 2012 and 2013. For workers who are single or unattached, however, 2013 was relatively and significantly more stressful than 2012, even if the overall average is below the scale mid-point of 3.0. Workers without children reported significantly higher work stress in 2013 than in 2012. For workers with children, the opposite was true--2013 was less stressful than 2012. Though organizations have to adopt policies that will meet the needs of workers with or without children, it is imperative that such policies do not favor one over the other and should be adopted to changing external circumstances for either demographic group. For both female and male workers, 2013 was slightly but significantly more stressful relative to 2012. Workers in shift schedules or working in irregular hours generally report significantly higher work stress than workers with regular hours. Such sentiments became significantly even more pronounced in 2013 especially for workers with shift schedules, though both shift and non-shift workers reported generally higher stress levels in 2013.